How Many Types of Conveyor Belts Are There? What Are The Different Conveyor Belt Types? Why Conveyor Belts Are Necessary in Industries? Most of industry preferring automation tools & equipment’s because it saves time, money & man power. 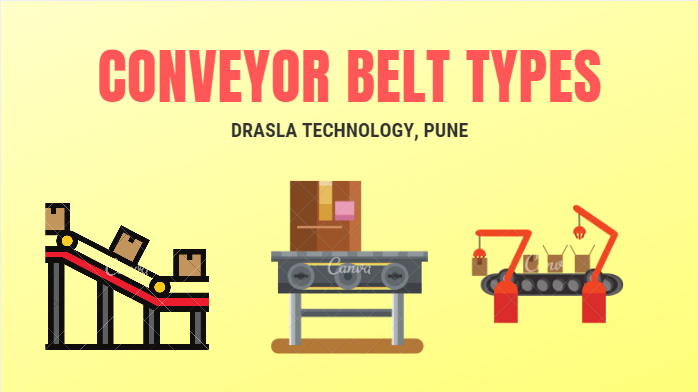 & conveyor belts is an best example of that.Today I am going to provide you the brief overview of conveyor belt types which helps you to choose perfect conveyor for your industrial use. Total 14 different types of conveyor belts available in market. each one is use to perform specific task as per industrial application. If you want chip conveyor or conveyor belt @wholesale price contact here. You have just checked above, the list of different conveyor belt types. Now we will check more details about each one in terms of industrial use, features, specification & cost. Slider Bed: The surface of Slider bed conveyor made up of steel or sometime Masonite. main function is to carry goods or items. best use for sorting, assembly line operations, inspection & packing. Roller Bed: When you required a long transportation of goods or items roller bed conveyor is your solution. name itself gives the idea that this conveyor belt comprise of rollers on it. Filter Belts: If your company deals with water treatment then filter belt conveyor is must for you. main working function is to drain out excess toxic or liquids & permits particle to pass through filter instead being carried out with system. Hinged belts: Working in scraping & recycling domain industry then hinged conveyor belt type are effective solution. solid surface with interlocking hinges & sturdy model makes it to use rigorously. Woven metal belts: mainly use for heating process, drying & cooling in the glass-working, food & electronic industry. interlinking chains of wire or metal designed allow airflow as product moves. custom design provided by manufacturers if you want it. Portable Conveyor: As name suggest its consist of caster wheels to move from one place to another. length can be extended if customer’s like you want it to. Flat Belt Conveyors: Most commonly used to move object from one end to other. powered pulley helps to move flat belt conveyor. Solid, general-use belts: Most widely used fabric or rubber belt in the mining or milling industries for carrying bulk raw ore & aggregates, airports to luggage handling. Plastic interlocking belts: If looking for alternative to fabric & metal conveyor belt types, then plastic interlocking conveyor belts must be your choice. mostly use in food handling or automotive industries. Modular Belt Conveyors: The most unique feature of this belt is it’s belting has individual interlocked segments over single continuous loop system. easier to repair as compare to flat belt type. resilient to sharp, abrasive materials. Cleated Belt Conveyors: Having the vertical cleats (barriers) along side of width. which helps material safe without any damage during incline or decline points. Curved Belt Conveyors: its unique curved frame features makes a use of available floor space by carrying the material around the corner of floors. Brake and Meter Belt Conveyor: It has two parts brake belt installed at end of the part for accumulation & other one is meter belt for material separation purpose. length should be 1/7th of total length of accumulation conveyor. Incline or Decline Belt Conveyors: It has nose over & feeder portion. it has rough surface than smooth one for better grip to items or materials to hold on. So this is all about the different conveyor belt types Now you have got the idea that each conveyor belt has its unique feature & industrial application. Choose the one which meets your industry needs & provide smooth workflow and solution. Drasla Tech is Pune’s leading wholesale dealer, trader, manufacturer and supplier of Industrial Equipment. supplying quality equipment to the mechanical, electrical and electronics companies all over India. and soon we are going to expand and trade to abroad companies in coming years.